Teddy Bears' Picnic day is July 10. What a lovely day this will be to grab our favourite teddy bears and head to the park, the woods or a patch of Australian bush for a picnic! It would also be a fine day to introduce our kids to books about bears. Winnie the Pooh is one of my favourites, but there are many more. What fictional bears do your kids know? The Berenstain Bears certainly count. Extra points if the main character is a teddy bear AND in a book. If you missed my recent review of Bearly There, you can catch it here. Another teddy bear book I love is Two Tough Teddies. Why not sing the Teddy Bear's Picnic song with your kids? (DLTK have all the lyrics.) Sing it forwards; sing it backwards. Sing it while you skip along a path through the woods. (Sunlit woods, not the wolfish kind!) If you have time, make some bear prints from card and lay them out for kids to follow. Perhaps the prints will lead to treasure? Cooking with kids (no, I don't mean you use kids as an ingredient!) is a wonderful way to sneak lots of learning into a fun activity. Why not teach them how to make some healthy snacks for your picnic, or have them decorate cupcakes? For the more adventurous, here's a teddy bear birthday cake. Kidspot have some fun and simple teddy bear recipes. Once you've cooked up a storm, it's time to invite some friends to your teddy bears' picnic. Kids will learn lots by designing and composing their own invitations. If they'd like to include an illustration of a cartoon teddy bear, learn how to draw one at How to Draw Funny Cartoons. Children at school could dress their teddies and put them on show. For older kids, challenge them to dress teddies as book or movie characters. For clever kids, invite them to play on words with their bearish characters e.g. Threadbear - a bear with his fur hugged off; Bearrister Bear - a bear in wig and gown with legal books; Bearista - a bear jiggling a coffee machine made from card; Napoleon Bonabear - a bear in bicorn hat and sash, with his paw in his vest etc. Invite parents and grandparents to visit the display, and enjoy honey sandwiches and tea. 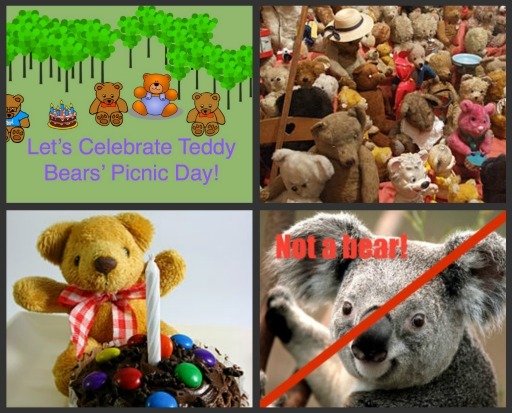 Discover some lovely Montessori-inspired ideas for celebrating Teddy Bears Picnic Day at Living Montessori Now. Older children might also enjoy skimming the Steiff site and taking a look at some collectors' bears. Steiff's Louis Vuitton teddy bear apparently sold at auction for $2.1 million. How much do your kids think their own teddy is worth? Discuss: Is money the only way to measure value? 3. Clipart and koala from Clker.